Founders of Museea, Sofia Hedman and Serge Martynov have curated and designed numerous exhibitions in London, New York, Saint Louis, Tokyo and Stockholm. 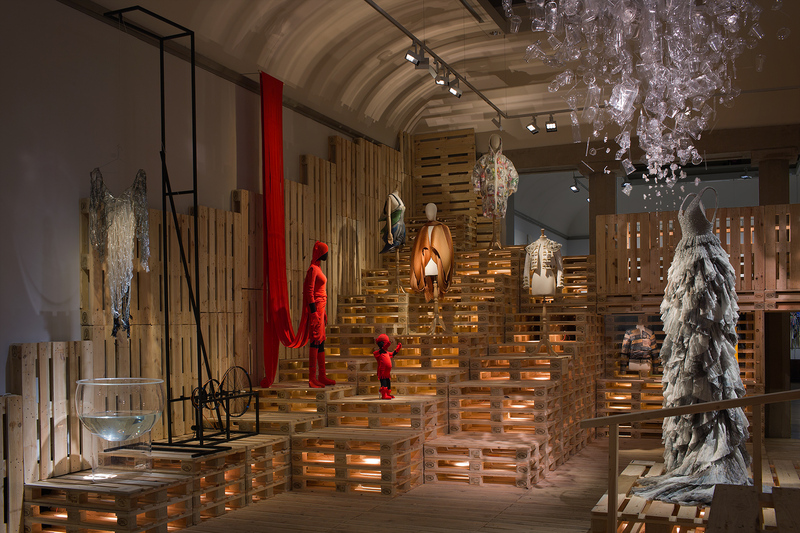 Their latest exhibition Utopian Bodies – Fashion Looks Forward (2015 – 2016) at Liljevachs Museum, Stockholm, was awarded the title ‘Exhibition of the Year 2015’ by The Association of Swedish Museums. Address contributor Flavia Loscialpo asked Sofia and Serge to reflect on their curatorial practice, utopias, and new challenges emerging within contemporary curatorship. Flavia Loscialpo: Exhibitions like Utopian Bodies contribute to highlighting the fundamental role of exhibition makers and curators as creators of the mise-en-scène in the exhibition space. Utopian Bodies and many other exhibitions you have curated seem to be characterised by theatrical and immersive displays that choreograph and articulate the narrative of the exhibition. Can you give an insight into your philosophy of exhibition design? Sofia Hedman and Serge Martynov: For us curating is a way of guiding the viewers, and let them see the object in a certain way; it is about storytelling, creating new connections, whilst enabling openness. The exhibition design can let visitors take in the objects in a way that it is easy for them to ‘group’ and make sense. For some of our exhibitions, we have worked mainly with contemporary objects, rather than with extensive historical archives. These displays present different challenges and opportunities, and perhaps a greater freedom emerges. However, there is a fine balance when planning and creating the installation, as the challenge is not to let the mise–en–scène overtake the objects. For Utopian Bodies, every section was inspired by a utopian idea: the various installations incorporated references to these utopian concepts or innovations, but at the same time we did not want the backdrop to overtake the exhibits. In all the thematic sections, the aim was to let the contemporary resonate with the past, and to get the audience curious about history. It was a way to illustrate historical ideas and innovations within the exhibition design, and put the objects into that context. The experience visitors have within the exhibition space is for us very important. We had a wish to attract people that would not normally go to fashion exhibitions, and to make young generations appreciate objects, by opening their senses. Fashion related events or exhibitions tend in fact to be exclusive or even uninviting. Utopian Bodies instead was supposed to be for everyone: we tried to make it engaging for younger generations, who rely very much on technology within their daily life and are used to a mediated experience, as well as for people that had never seen a fashion exhibition. It is interesting to listen to their reactions, find out what people like, what they focus on, and what their favourite details are. It is always a surprise. Some aspects might be predictable, whilst others are quite unexpected. As you explain, the design of each section was inspired by a utopian movement, object or innovation, with references to these utopian ideas informing also the mannequins. The body has a specific centrality in the title – how is it challenged and explored in the exhibition, also perhaps through the display? The concept of utopia is a rather tricky subject, since one person’s utopia could well be another person’s dystopia, as Elizabeth Wilson pointed out when we had our very first conversation. Therefore, in articulating the narrative, we did not want to be prescriptive and define what utopia is, or illustrate what good utopias are for each theme. Rather, our aim was to let the objects resonate with the past, with old utopian ideas and innovations, and highlight the positive aspect of fashion and human creativity, showing how it can be used to create a better place. We also wanted to give voice to the freedom fashion allows: even though some people might not like fashion, through they way they dress, even unintentionally, they make statements. Within Utopian Bodies, we created various sections or ‘worlds’, where the exhibits can resonate with the past, through the display as well as the mannequins. Without being prescriptive, we invited visitors to search for their own utopia. Regarding the body in particular, our focus was both on individuality, that is, the potential a person has to be an agent of change, and the collective dimension, on how fashion can enable interconnections between people and encourage solidarity. We also wanted to focus on the individual body, by embedding personal, sensorial experiences in the exhibition. For us it was important to reflect on how the body engages with materiality, how it can be extended through technology, how it merges with an object, to finally question where the border between the human body and the object can be. 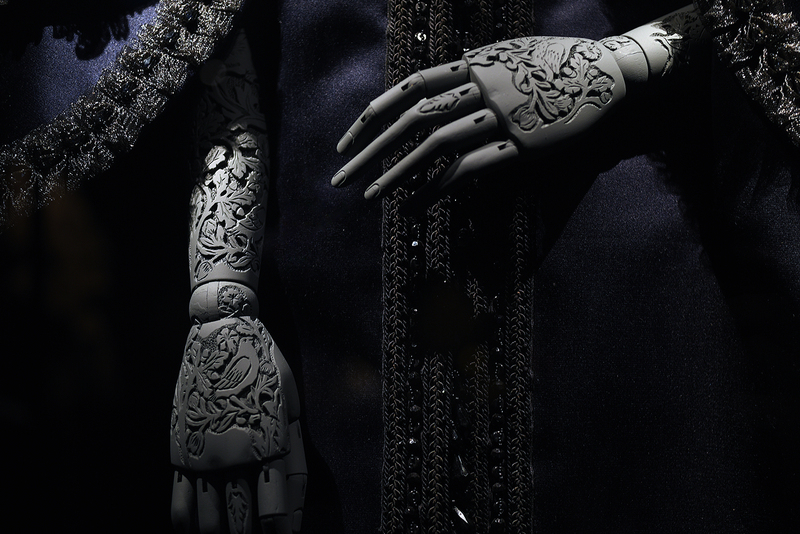 Utopian Bodies – Fashion Looks Forward, section ‘Craft and Form’, Schiaparelli Haute Couture and special commissioned wood carved mannequin arms by Anastasya Martynova. Photo by Serge Martynov. Collaboration is very important to your work: starting from your own partnership, and the collaboration with other artists, designers and academics. Can we talk about this aspect of your work and the dialogues you have created through the special commissions for Utopian Bodies, which featured original and unique works by 16 Swedish designers? For Utopian Bodies, we invited 16 artists and designers through special commissions, and it was very interesting to see them reacting in different ways to our invitation. There was a rather clear division, as some of them reacted enthusiastically to the concept of ‘utopia’, whilst others tended to delve, through their creative process, into the more problematic aspects of the theme. These differences were extremely valuable as they allowed us to engage with the project from very different angles and perspectives. Overall, our main focus is on the possibilities that emerge, and our intention is to get people imagining a better future through articulating alternative realities. This was an interesting aspect of the collaboration with the various designers: the theme of ‘utopia’ directly resonated within some of the artists’ work, whilst other artists, although less directly related to utopias, developed work with a clear political dimension, which dealt with specific issues addressed by the exhibition. In each case, we suggested a context for their creation, but worked in dialogue with the designers: for instance, we sent them the design for each room and the text panels, to provide a clear view of the narrative they would have featured in. The whole project was quite an experiment for us. The installation for the ‘Technology’ section of Utopian Bodies is inspired by early sci-fi cinema and scientific romance novels of the early nineteenth century. It is very interesting as the exhibits are immersed in this multimedia structure containing them and providing an interactive experience. How do you engage with technology and interactivity within your work? Some sections of Utopian Bodies enabled interactive experiences; for instance the ‘Technology’ section included an interactive display for kids, featuring a prosthetic arm and computer games. Other sections displayed objects that interacted with the visitors, such as the creations by Ying Gao, which react to the spectator’s gaze or voice. In the ‘Love’ section there was a special commission, which reacted differently to the proximity of each viewer, almost having its own voice or personality. Nowadays, as our relationship with technology is an integral part of our lives, audiences of exhibitions might have different expectations compared to the past. We believed that one of the reasons the public appreciated Utopian Bodies is the fact that it enabled them to immerse into many different worlds, and engage with the broad theme of ‘utopia’ in various ways. The rhythm we created between the rooms and sections was a crucial part of the narrative. Moreover, one of our main aims was to engage kids, by letting them think about clothes differently, and inspiring them to create a better future. The lowered and simplified labels, the workshops and talks led by artists and designers, aimed at considering how kids will take over in the future. For instance, the tunnel at the entrance of the exhibition is the result of a collaboration with Beckmans College of Design, Stockholm, and was created by artists using clothes that ten people would buy during a whole year. Materialising this incredible amount of clothes, rather than just representing it, was a way to get young and older visitors to think about our consumption habits. Utopian Bodies – Fashion Looks Forward, ‘Technology’ section. Photo by Mattias Lindbäck. Fashion scholar Elizabeth Wilson once wrote that fashion within the context of the museum or gallery represent ‘the atrophy of the body and the evanescence of life’. For Utopian Bodies she has written a fantastic review, commending your work and has been involved in this project. 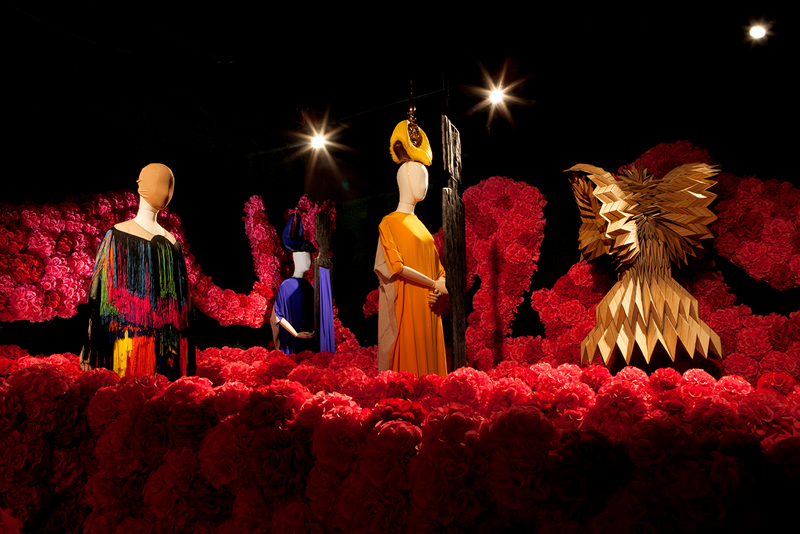 Do you think that something is changing within contemporary criticism surrounding fashion exhibitions? To put it briefly – do you believe the museification of fashion is still perceived as opposed to the dynamism of modern society? Elizabeth Wilson was the very first person that saw the draft of the exhibition and provided feedback on the concept. It was very useful to have her involved in the early stages of the project. At first, she had strong reservations on the theme of ‘utopia’, suggesting that we could make the exhibition experience an open one, without interpreting utopia prescriptively. Overall, she was very supportive and, as we discussed the project further, we understood more each other’s points. As a discipline and practice, curation has dramatically evolved, and so has contemporary criticism on fashion exhibitions. So much is happening right now within the curatorial field: there are increased opportunities, challenges and awareness. There is an emphasis on sustainable practices, as well as a preoccupation to not be always so Eurocentric or Western-centric. Every decision reflects a critical stance, and therefore many things could go wrong in the process. It is a very difficult time to be a curator right now. We live in fact in a global society but, as sociologist Zygmunt Bauman points out, we do not necessarily behave like it. Nowadays, there are still cultural and language barriers that could represent some limitations to the work of curators. In 2012 and 2014, we had the privilege to work with the Korean Cultural Centre, on A New Space Around the Body and K-Fashion Odyssey, which both showcased the work and potential of emerging Korean designers. We believe it is important to be more open to cultural diversity within exhibition making, by considering what it is happening within other cultures and adopting a global perspective. In May 2016, we took part in a panel discussion about the future exhibition Items: Is Fashion Modern? (MoMa, New York, 2017), as we are part of its advisory board. The discussions focussed on modernity, and all the contributions to the panel highlighted how this concept might vary across different cultures, since what modernity is in US is very different from what might mean within African cultures. As a curator I think it is relevant to explore fashion from a social and psychological perspective as we deal with desires, hopes and symbols. Any exhibition, just as A Queen Within, is very much about storytelling, about remapping and recreating associations; when we curate an exhibition, we try to make sense of the world within a particular culture, and more broadly within visual culture. Curating is also about challenging assumptions. For instance, although A Queen Within was not a glorification of royalty, the title might allude to it, and some people might have reservations against the theme. Curating is about enabling connections and, from them, letting emerge new meanings and interpretations. Regarding the associations informing the ‘queen’, whether we consider Jung’s contribution still relevant nowadays or not, or whether one agrees with it or not, Jungian archetypes are still very telling about society, our desires and visions of the world, to which we often dress accordingly. In developing further projects such as A Queen Within or Utopian Bodies – for instance for different venues and audiences – it would be interesting to adopt a global view, and give more space also to the male perspective. Queen Within – Adorned Archetypes, Fashion & Chess by Serge Martynov & Sofia Hedman – Museea, Maison Martin Margiela, Rejina Pyo, Keta Gutmane, Commissioned head dresses Charlie Le Mindu, Mother Earth Queen. Photo: Sarah Carmody. Flavia Loscialpo, PhD, is a London based researcher and academic, currently Senior Lecturer and Research Fellow in fashion. Her interests are at the intersection of philosophy, fashion and visual culture. Her recent research focuses on avant-gardes in art, design and fashion, on utopian projects, contemporary curating and digital technology.